Join Alan and Jack as they set off into the lush forest...and into a whole load of trouble! Silly situations, repeated vocabulary and bright pictures on every page help children to feel confident as they build up their reading skills. It introduces words such as leaf (one of which thwacks Jack in the face) and gorilla (which gives Alan a hug). Learning to read will be no trouble with this exciting and amusing adventure. This story of tropical trouble makes reading fun. The book can be used in several ways to help readers gain confidence. Start by reading the illustrated words at the edge of each left-hand page with your child. 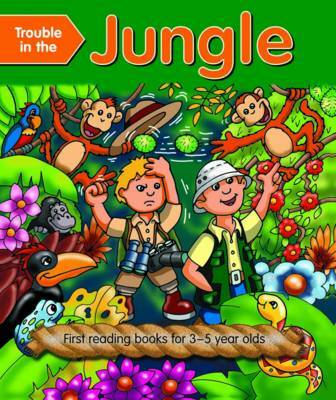 Have fun trying to spot the same terms in the story itself, as Alan and Jack gradually lose their supplies of fruit and snacks to an affectionate ape, a mischievous monkey, a pesky parrot and a slithering snake. Finally, all the illustrated phrases can be found at the back of the book. Enjoy checking all the words that you can now read together!